The two series of joystick stations JULIET-PK and ROMEO-PK are designed to be fitted with the two joysticks JULIET or ROMEO. 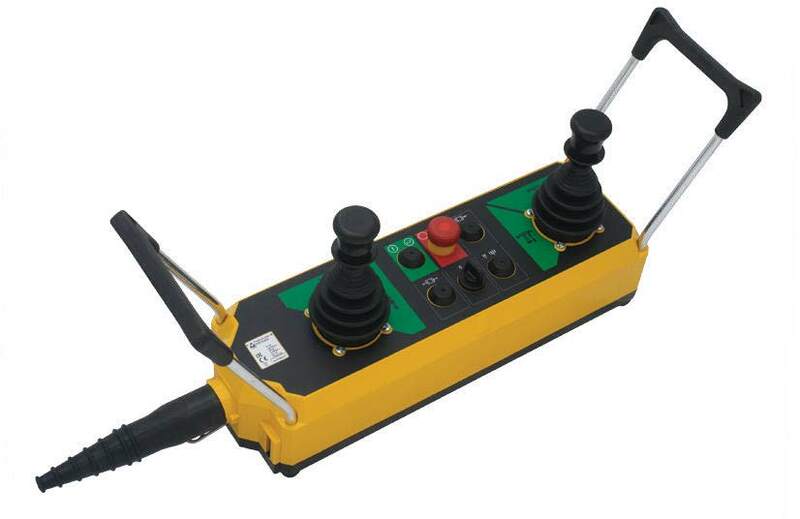 Each series of joystick stations has specific features allowing the choice of the equipment that best suits specific requirements.The emergency stop mushroom pushbuttons comply with EN 418 regulation and it is equipped with NC contacts of the positive opening type for safety functions. The emergency stop mushroom pushbutton has a central position on the joystick station for instinctive use in case of danger. A wide range of actuators are available: pushbuttons, toggle selector switches, key selector switches and pilot lights.Rubber pushbuttons ensure protection against dust penetration, preventing them from becoming stuck when the control station is used in particularly harsh conditions. Discs comprise of a molded two-color arrangement offering a combination of clear reading of symbols and text with maximum wear resistance. Joystick stations have cable sleeves for cable entry and contacts equipped with screw-type terminals. The variable length carrying strap can be quickly coupled and it can be either fastened around the waist or hung on the shoulder. Please call or email for details on specifying your custom Joystick Station here.